The wolf (canis lupus) is a predator of the canine family. The relationship can be seen from their outward appearance. Wolves resemble Alsatian dogs but are considerably larger. Their fur colour can vary significantly. A huge range of colours can be seen including white, brown, grey or black. The change from summer to winter coats gives wolves a different appearance depending on the season. In winter the animals look very powerful with their long, thick coats resembling the normal image we have of them. In the summer months the animals are almost lanky in appearance due to their thinner coat of fur. Their legs and ears appear to be longer and the tail less bushy. The size and weight of the animals varies significantly by region. Shoulder heights can range from 70–90 cm, length from 100–140 cm and weight from 30–50 kg. Wolves in temperate regions of central Europe mostly have grey fur and a weight of 30–38 kg with a medium figure. Female wolves are on average 15–20 % smaller and lighter than the males. The bushy tail is about a third of the head to rear length. During the night, wolves can cover distances of up to 20 km in search of food. Their body shape is perfectly adapted to running. The long legs, powerful neck and slender stomach allows the wolf to cover huge distances without problems. They move at a swift loping pace which is highly energy-efficient. The rear paws are placed exactly onto the print of the front paws. The resultant double paw prints are set about half a metre apart from one another. The differences between the wolf and domestic dog can vary greatly depending on the breed of dog. Some breeds like the Jack Russel or Labrador have very clear differences in their outward appearance to that of wolves. With other breeds such as the Czechoslovakian Wolfdog or the German Alsatian it can be difficult to make clear distinctions, even for wolf experts. Compared to most domestic dogs, wolves have large wide heads. The lower side of the mouth down to the throat is mostly light coloured. 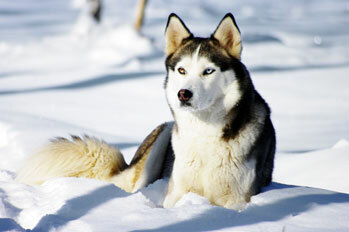 The face shows more contrast, but unlike the Siberian Husky has no mask. 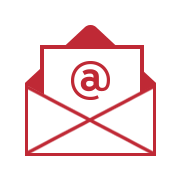 The tail of the wolf either hangs down or is held horizontal – never is it held upwards. Their bright, piercing eyes are also characteristic of wolves. Indications of wolf activity can also produce distinct tracks. Wolves move over great distances with a swift pace and leave a very typical set of marks. Dogs may display similar tracks in snow or loose sand over short distances. To consider it the swift pace of a wolf, the tracks need to stretch for long distances. The rear paws should be placed in exactly the same place as the prints from the front paws, creating a double print. This double print run in a straight line with a distance of about half a metre between them. The individual paw prints are elongated ovals, at least 8 cm long with the 4 balls of the toes clearly visible. The claws can also often be seen. The way in which dogs and wolves kill their prey also differs. A quick, targeted bite in the throat is used by wolves to kill their prey. To bring down larger animals they will also bite the flanks and haunches. Dogs on the other hand are less specific when biting prey and generally leave numerous bite injuries all over the body. Wolf faeces contain traces of things such as hairs, bits of bone, sometimes even the teeth and hooves of their last meal. Wolves mark their territory by leaving faeces on routes, crossings or forest paths. Dogs, in contrast, relieve themselves to the side of pathways. The shape and size of wolf droppings is not that much different from dog droppings. If after checking for these features you are certain that you suspect a wolf, please notify the relevant nature conservation authorities. Wolf monitoring experts will then begin further investigations! Wolves are highly sociable animals and live in family groups – the pack. Animals that are seen alone are usually young animals on the search for a partner to start a pack of their own. A pack generally consists of the parents and children from the last 2 years up to their sexual maturity. Should additional support for raising young or hunting be required, then other relatives may join the pack. 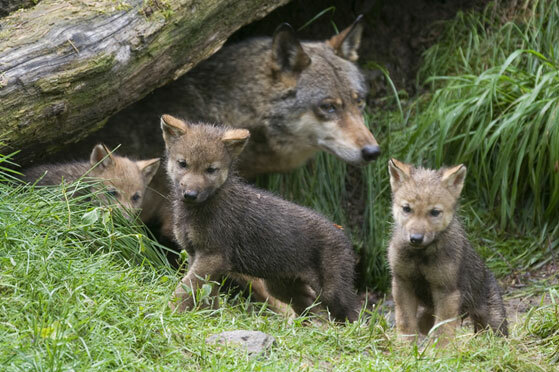 The hierarchy of the pack sees the parents at the top, followed by the males of the previous two years. The pups are not part of this hierarchy and enjoy a certain level of protection. These animals have various means of communication. 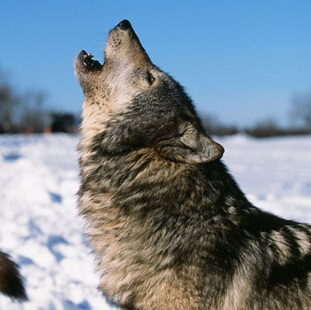 Alongside facial expressions, body language and noises such as growling, howling or whining, wolves make use of smell of as one of their main means of communication. Unique bodily scent secretions and droppings inform other wolves about territorial boundaries and readiness to mate, amongst other things. The female wolf is ready to mate from the end of December to April. After a pregnancy lasting around 63 days she gives birth to 4–7 pups in a specially constructed den. The young pups are born blind and dumb, but with a fine coat of dark fur. 3 weeks later, the pups leave the den and start to explore their environment. They are nursed up to the 9th week, before slowly releasing themselves from their mother. At 22 months the young animals are sexually mature and go off to search out their own territory. In the search for their own territory, young wolves can travel for more than 2,000 km. Wolves living in the wild have a life expectancy of 10–13 years, with many dying in the first 2 years of life. In captivity they can reach 17 years of age. Wolves feed mostly on medium-sized, herbivorous mammals that they come across in the areas they occupy. In central Europe, wolves mostly go after hoofed game like red deer, roe deer or wild boars. In northern Europe, reindeer and elk are most popular. In southern Europe the animals are increasingly moving into populated areas and finding food in waste and eating cattle. Depending on what's available, they will also eat small animals such as rabbits, mice or birds as well as animal remains and fruits. A wolf needs to eat about 4 kg of digestible meat per day. This approximately equates to one roe deer every four days. Wolves are highly adaptable animals. They can live in both temperate forested regions as well as in the deserts of Mexico. Areas uninhabited by humans in the northern tundras are home to wolves just as much as the urban areas of the Iberian peninsula. The basic requirements for wolves moving into an area are the presence of sufficient food and places to hide. Each pack of wolves takes up residence in their own territory and defends this against unknown wolves. Depending the food available, territories can cover areas from 150 to 350 km². The more prey animals available, the smaller the territories need to be in order to feed the whole pack. Wolves were originally found across the whole of the northern hemisphere. Increasing destruction of their habitats and ruthless hunting has unfortunately led to the wolf disappearing from many regions. Whilst wolves have managed to survive in parts of southern Europe such as the Iberian peninsula, Italy, Greece, Romania, Russia, Ukraine and Poland, they died out in other areas of Europe in the middle of the 19th century. After numerous conservation efforts they have gradually started to make their return in the Czech Republic, southern Scandinavia, the French Alps, Switzerland, Austria and Germany! Legal regulations since the 1980s have led to a slow recovery of wolf numbers in Europe. Out of the approximately 20,000 wolves living in Europe, around 80 make up the population for Germany and western Poland. Due to the low number of mature wolves capable of reproducing, this population remains in acute danger of dying out. Wolves have therefore been protected through various international, European and German laws and conservation agreements. As a result of the Washington Convention (appendix II), strict import, export and marketing bans now apply in Europe. In line with the Habitats Directive 92/43/EEC, appendix II, IV, V which are derived from the Berne Convention, special conservation areas for wolves must be identified. 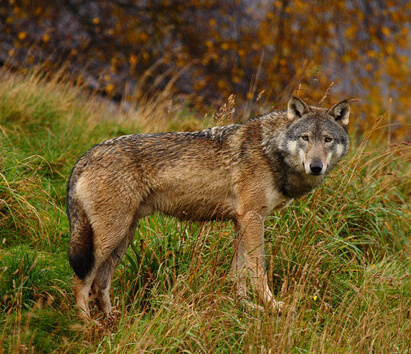 The German authorities must therefore make regular reports about the respective conservation measures and conditions of habitats and wolves living in the wild. Wolves have very strong protection at the federal and state level from the Federal Nature Conservation Act. According to § 44 sec. 1 item 1 of the Federal Nature Conservation Act, it is forbidden to capture, injure or kill wolves. Furthermore, it is forbidden to damage or destroy breeding and sleeping dens of wolves (§ 44 sec. 1 item 3 of the Federal Nature Conservation Act). Significant disturbance especially during the mating and breeding seasons is forbidden (§ 44 sec. 1 item 2). 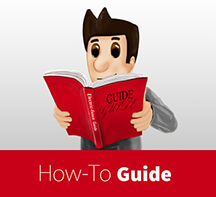 The granting of any exceptions or dispensations to the ban as defined by the above law may only be issued by governments as the highest nature conservation authorities. Exceptions can be granted to allow capture or killing of a wolf in exceptional situations where there is a danger to human life. Only in the state of Saxony is the wolf considered a huntable species and is also subject to the hunting law.